Fraserburgh Rugby Club has joined forces with Trust Rugby International (tri) in a bid to make the sport accessable to all. tri is a Scottish charity that was set up in 2010 by Jamie Armstrong to bring individuals and communites together through the game of rugby. Since 2012 the charity has focused on ‘unified’ rugby, meaning players of all abilites can train, play and compete in a team playing contact and touch rugby. The charity currently has three Clan teams in Scotland but they are all based in the central belt, although plans are being made to create the ‘Caledonia Clan’ and the charity is looking for players from across Aberdeenshire to take part. 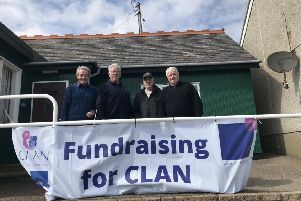 David Cranston of Fraserburgh Rugby Club had noticed the charity’s work and invited the tri National Clan up north for a game earlier this year. Jamie said: “Everyone loved it. He continued: “We want to hear from anyone that would be interested in getting involved from players to helping with coaching, sponsorship or just someone to sort the kits. David said: “It’s not about winning, we are there to be team mates . Jamie added: “There is no distinction between disabled and able bodied players, everyone is treated the same. For more information about the Caledonia Clan or to pledge your support please contact David by calling 07496 538810. For details about Trust Rugby International or to learn more about they work that they do simply visit www.trustrugby.org or see their Facebook page by searching for tri - Trust Rugby International.